And many more if you search for "runic" at Quaddicted. 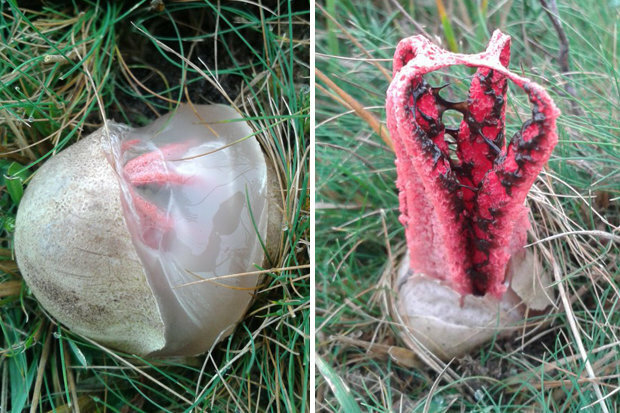 Clathrus archeri (synonyms Lysurus archeri, Anthurus archeri, Pseudocolus archeri), commonly known as octopus stinkhorn, or devil's fingers, is a fungus indigenous to Australia and New Zealand, and an introduced species in Europe, North America and Asia. The young fungus erupts from a suberumpent egg by forming into four to seven elongated slender arms initially erect and attached at the top. The arms then unfold to reveal a pinkish-red interior covered with a dark-olive spore-containing gleba. In maturity it smells like putrid flesh.